Lazer Tag combines team competition with hi-tech accuracy. The tagger unit has an LCD display control panel that provides a live-action video readout of seven game stats, and lets you see how you measure up to your opponents. Wireless set-up allows for quick and easy team play. Your tagger unit communicates with your teammates' devices. The heads up display unit provides you with real-time audio visual gameplay feedback, and fits on your head like a pair of sunglasses. 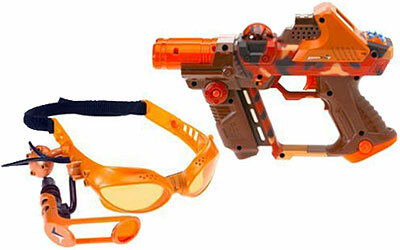 Upgrade laser tag system with the Virtual Scope and Thunder Pack accessories. The virtual scope aids aim with a virtual green dot that you can line up with your target. The thunder pack accessory gives three types of vibration that alerts you when you've tagged a target or when someone's tagged you.